Lawrence of Arabia (1962): Dir. David Lean. Written by: Robert Bolt and Michael Wilson. Based upon writings by T.E. Lawrence. Starring: Peter O’Toole, Omar Sharif, Anthony Quinn, Alec Guinness, and Jack Hawkins. Rated PG for violence. Running time: 227 minutes. Here it is, folks: the epic to end all epics. Mining the writings of British soldier and adventurer T.E. 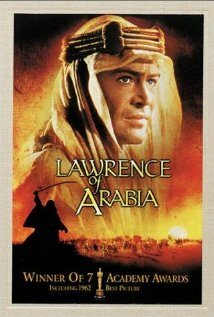 Lawrence (and the legends surrounding him), David Lean’s long slog through the desert boasts a potency only somewhat marred by age. Well-educated but growing complacent, British lieutenant Lawrence spends his days lounging around in Cairo before persuading his superiors to assess the situation in Arabia. He is sent to Jordan, tasked with gauging the strength of Arab revolts against the Ottoman Turks, a mutual enemy. From there Lawrence struggles to fight the Ottomans, unite the disparate Bedouin tribes, stay ahead of his British superiors, and somehow keep his identity intact. Renowned as an “epic,” Lawrence is not an epic in the same way films like Ben-Hur are epics. Rather, it represents the slow mental and moral decay of a man torn by loyalties within his surroundings and within himself. Director Lean exploits the trappings of epic films to show degradation, not growth, of the chosen hero. Peter O’Toole owns the role, communicating emotions ranging from naiveté to tormenting insanity. His face carries as much weariness and mystery as the desert itself. O’Toole’s performance is bolstered by a searing script from Bolt and Wilson, even if it never really explores the culture of the Arab tribes he encounters (which might have further complicated Lawrence’s identity crisis). And indeed, key characters tend to over-explain ideas better left to Freddie Young’s gorgeous cinematography. Nonetheless, the film seethes with raw energy and moments of aching power. At nearly four hours, and with a tone that seems to grow bleaker at an exponential rate, Lawrence won’t be for all tastes. But the film will last as long as myths and legends abound. And it will be around to question and critique those myths and legends.